This is my first experience with Rite in the Rain’s products. Jim K. from their PR team contacted me and asked if I’d be interested in doing a review of the No. 99 mechanical pencil, even though it’s a bit different from what I usually cover. 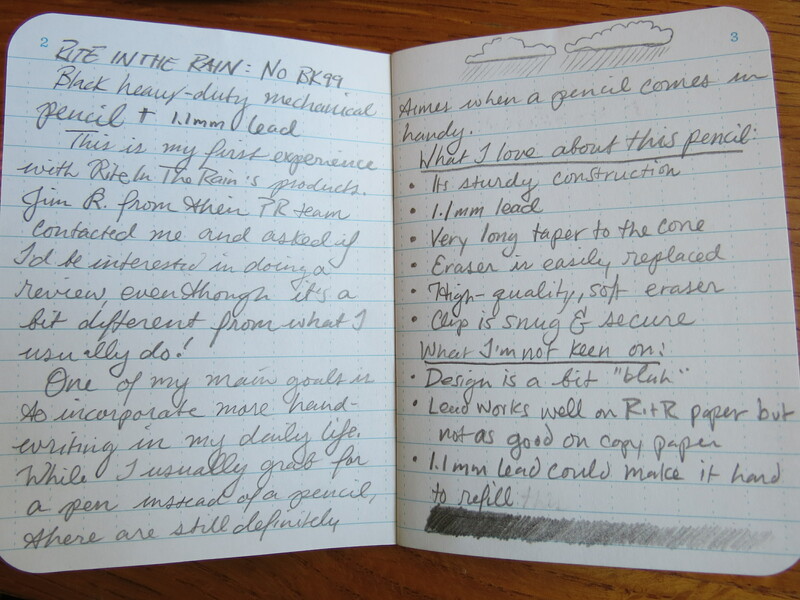 But one of my main goals in writing this blog is to incorporate more handwriting in my daily life. While I usually grab for a pen instead of a pencil (and, naturally, a fountain pen at that), there are still definitely times when a pencil comes in handy. 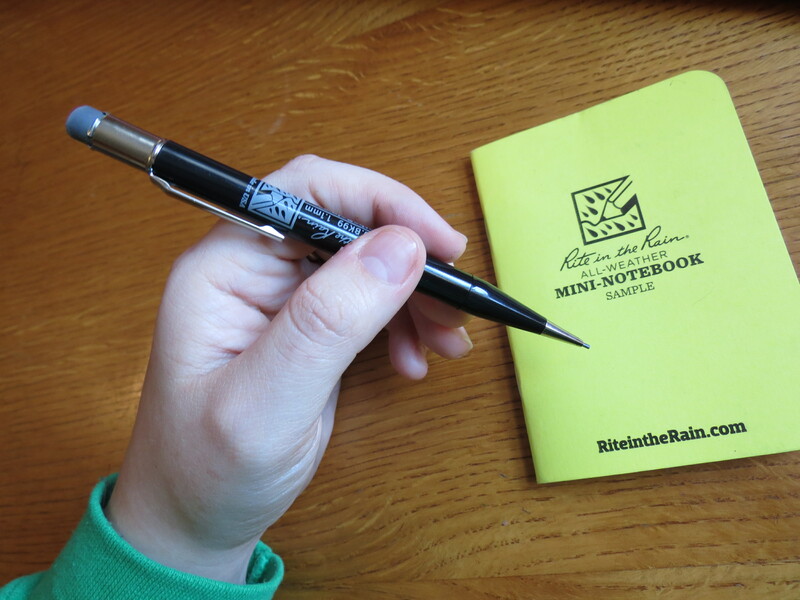 I drafted the original version of this review in the little sample pocket notebook that came along with the pencil (and I’ll have to do a review of the paper too, but I’m saving that for a later date). – Its sturdy construction. The barrel is made of synthetic resin, at least 1mm thick at the thinnest point and reaching up to 3mm thick. This is no dinky plastic Bic click-pencil. The fixtures are metal, too, so there’s no sacrifice in quality on the little details. – 1.1mm lead. I usually prefer finer points than this, but for a utility pencil it’s perfectly appropriate, not just for visibility of written text, but for durability of the refills. 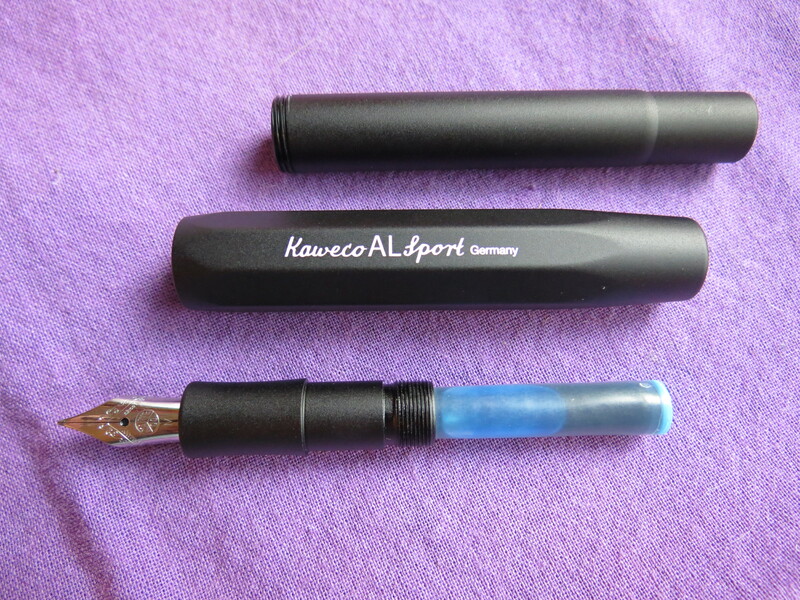 They are both thicker and shorter than standard refills, making them resistant to breakage inside the pen. They’re not especially soft, so while the line isn’t super dark, this lead sticks around! Note the lead at the bottom of the set: that is after about a week of use, writing this review and jotting down ephemera in my Field Notes. – Very long taper to the cone. I hold pens and pencils farther back than the average bear, and it’s my cross to bear that I’m usually grabbing onto uncomfortable threads. This cone is just under 1.5″ long from plastic base to metal tip. The seam between cone and body is noticeable, but not uncomfortable, and I find gripping right at the base of the taper to be comfortable and secure. – Eraser is easily replaced. Several folks who’ve done reviews on this pencil sing the praises of this eraser, and I’m fond of it, too — grey with a dull shine, but very soft. 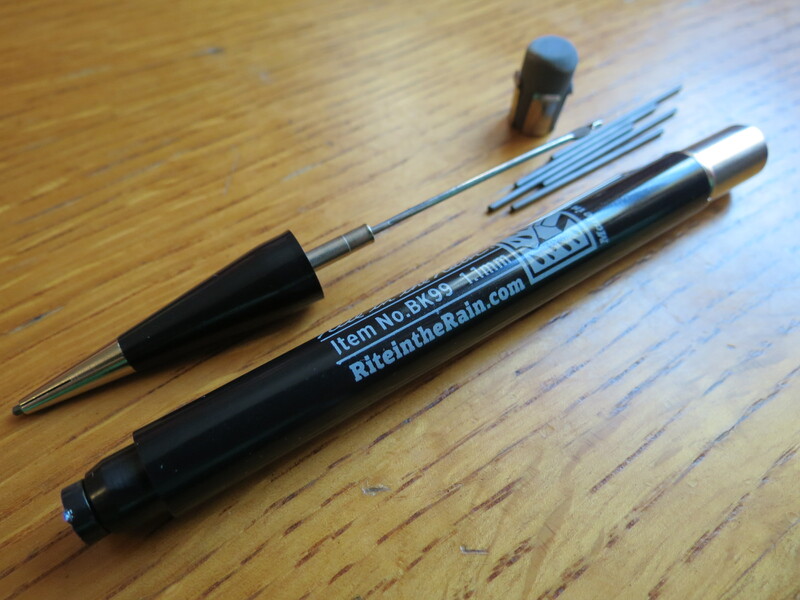 The refills come in a little metal clip so you don’t have to struggle with prying out an eraser you’ve worn down too flat. (The curse of the ordinary mechanical pencil!) 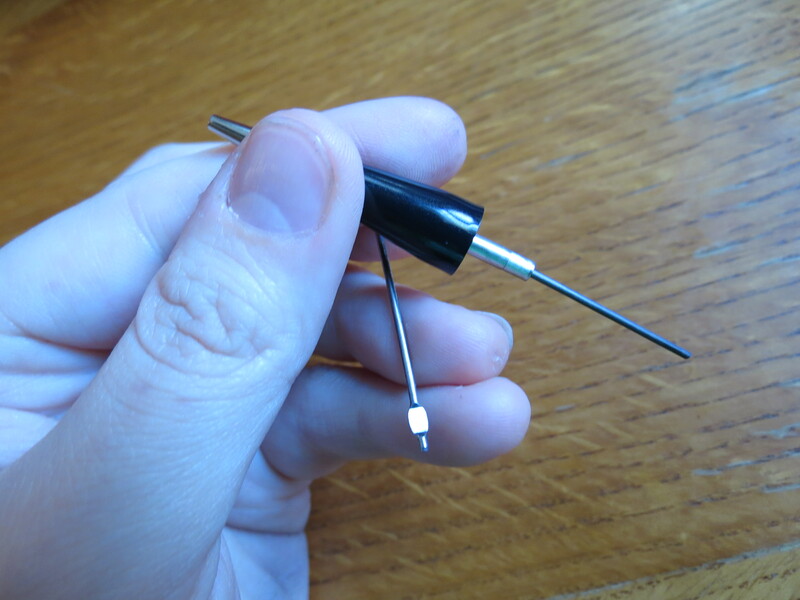 You just grab the rim of the metal clip with your fingernails and pull the whole thing out. – Clip has some flex to it, and is secure. I have no problem clipping it around the whole pocket notebook they sent, and I don’t have to worry about flexing it too far. – Branding is cool, sort of old-school-cataloging/inventory-chic. And whatever they use to print their text and image onto the barrel with is un-scratch-off-able! At least when subjected to the moderate abrasive properties of my fingernail. When I first drafted this review, I wrote “Design is a bit ‘blah. '” I meant this aesthetically; the engineering of this pencil is excellent. But actually, over time the design has really grown on me, and I think the red and yellow versions are even snazzier than the black. 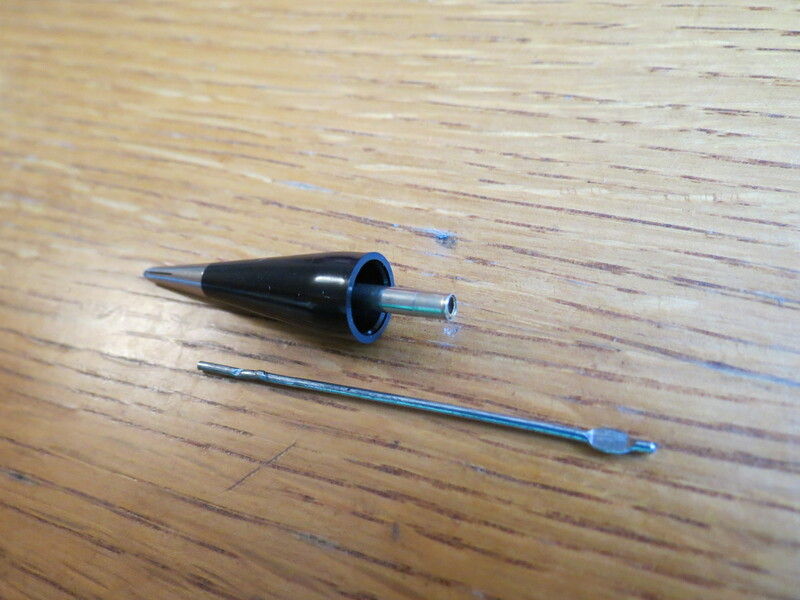 – The difficulty of finding 1.1mm lead could make it hard to refill. This is one big down-side to this pencil. I have no problem ordering refills online from Rite in the Rain, but the advantage a Bic click-pencil or a traditional wooden pencil has over this guy is that they’re easily available. Overall, I am really enjoying this pencil; it’s even spent some time in my EDC Hightower pen case this weekend. The non-pen-geeks I’ve shown it to have been enthusiastic about it, too. I can see it making a really good gift for tabletop gamers (can’t deface a character sheet with ink, of course! 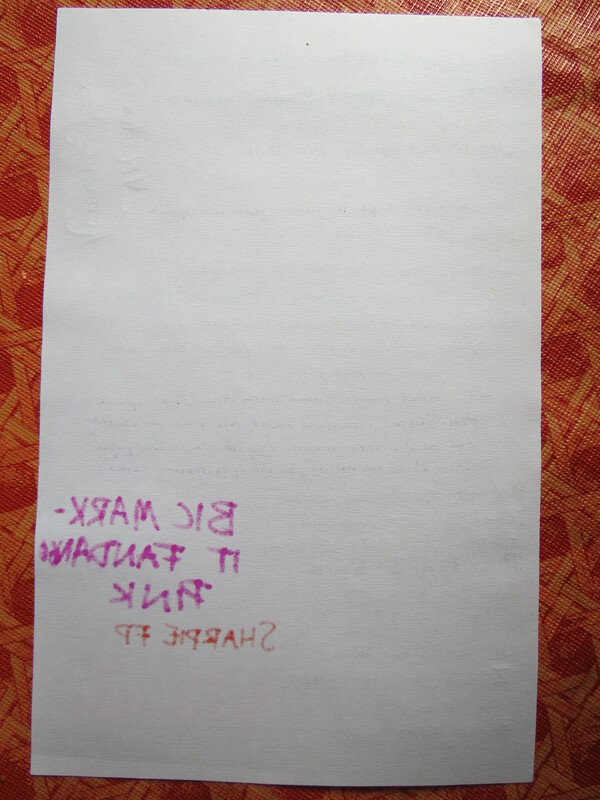 ), or musicians who take their show on the road and frequently find themselves penciling in notes on their sheet music. Of course, it would also be perfect for outdoorsy types who like to take notes or quick sketches on a hike. The products in this review were provided free of charge for purpose of review. These are my unbiased opinions. 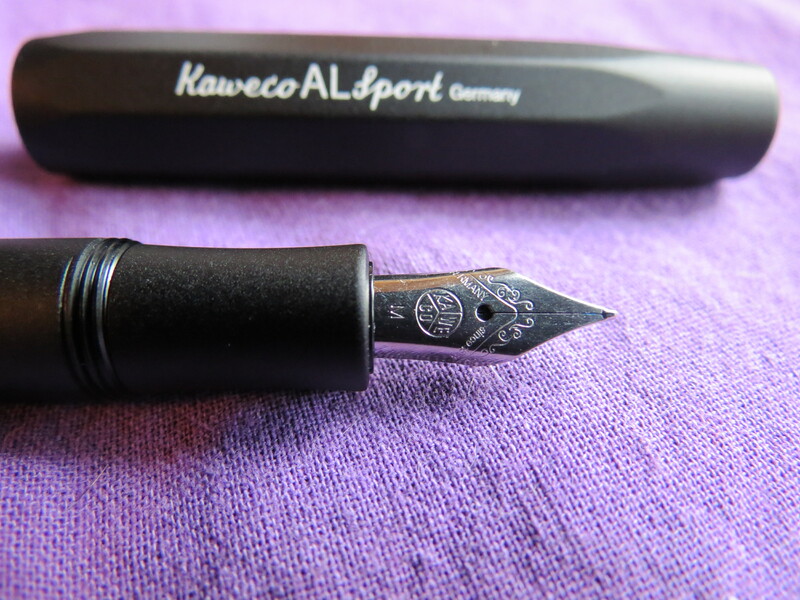 The first fountain pen I bought was a navy blue Kaweco Sport Chess, which, with its EF nib, instantly became my favorite go-to pen. 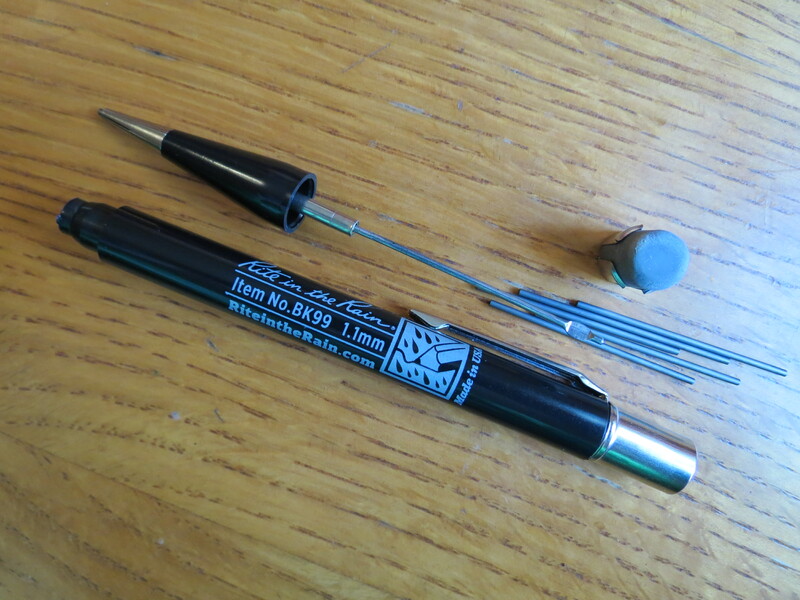 I loved it so much that when I lost the body of the pen, I bought a replacement immediately. 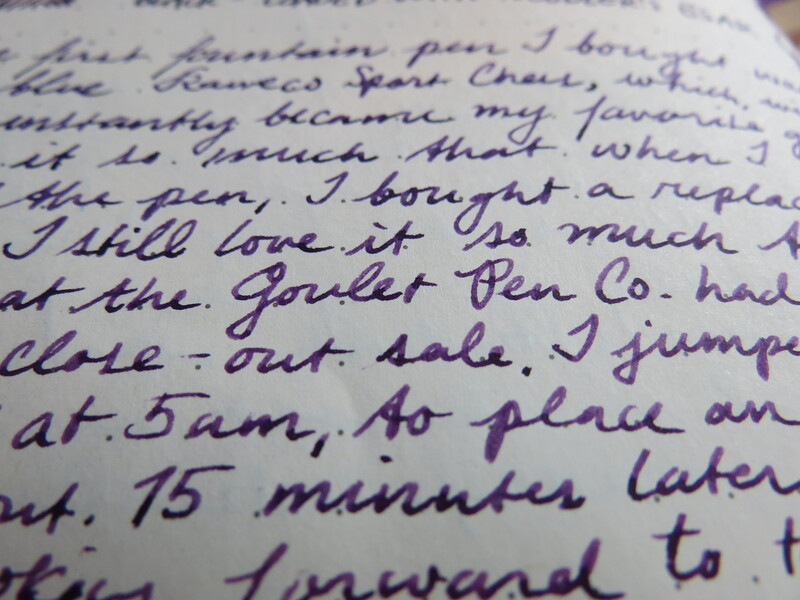 I still love it so much that when I saw that the Goulet Pen Co. had put its AL Sports on close-out sale, I jumped out of bed, bleary-eyed at 5am, to place an order before they sold out. Fifteen minutes later I was back in bed and looking forward to the arrival of this beauty. And a beauty it is. Its dimensions are the same as the classic Sport, but it’s a touch heavier and its furnishings are chrome-plated rather than the admittedly garish faux gold of the classic model. Like the rest of the Sports, it comes without a clip to keep the cost down. Clips are available for $3 to $4 depending on where you shop; if you check EBay, you might even find the new “N” clip — “N” for “nostalgia,” apparently. For the record: the design of this pen dates back to the original Sport that was first manufactured in the ’30s. And now that it’s made out of aluminum, one of these pens might last you another 90+ years (though the anodized finish will eventually scuff and scratch if you use it well). Far from being slick and cold and impersonal, the aluminum body has a matte finish that gives it a friendly, rough feel, and it quickly warms to your hand. I didn’t expect that, nor the sense of solidness and security that the weight imparts. 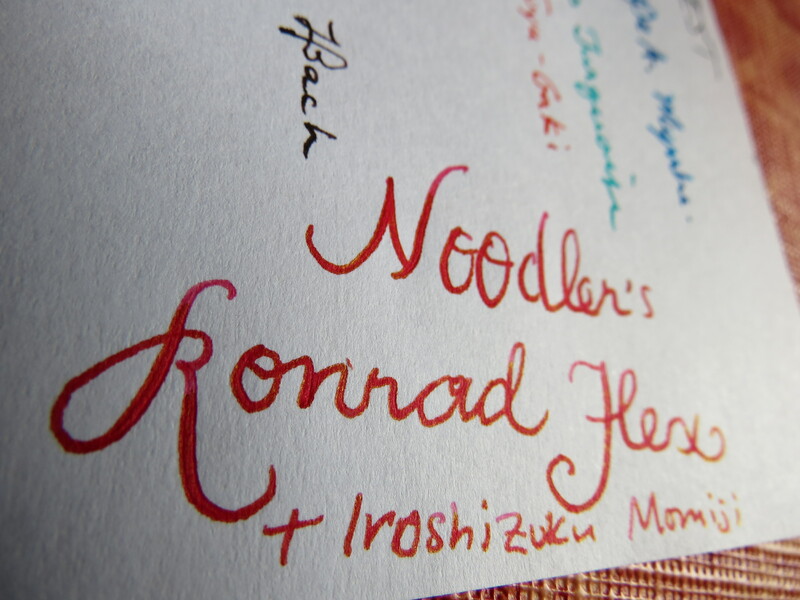 I also didn’t expect to be disappointed — for a second time – by the M nib. 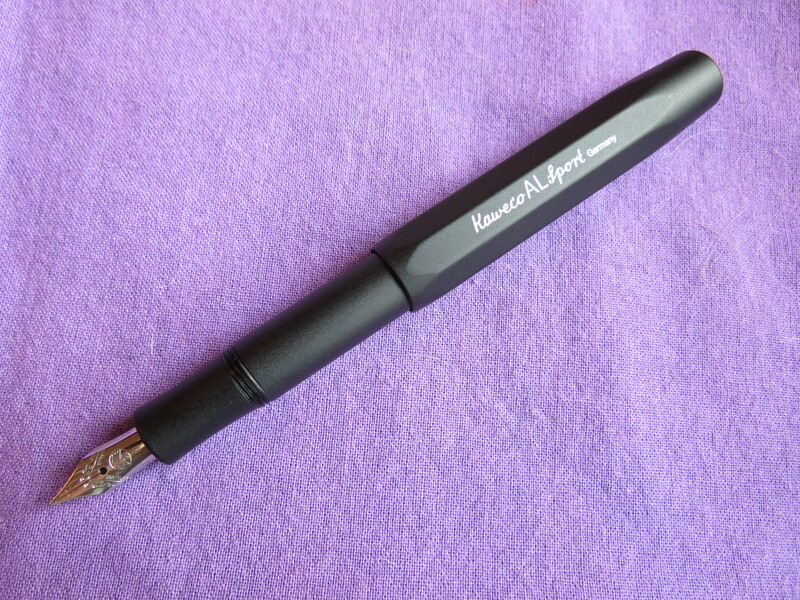 It, like the nib on my Student, has a very narrow sweet spot, and if you don’t hold it at exactly the right angle, it skips at nearly every opening stroke. 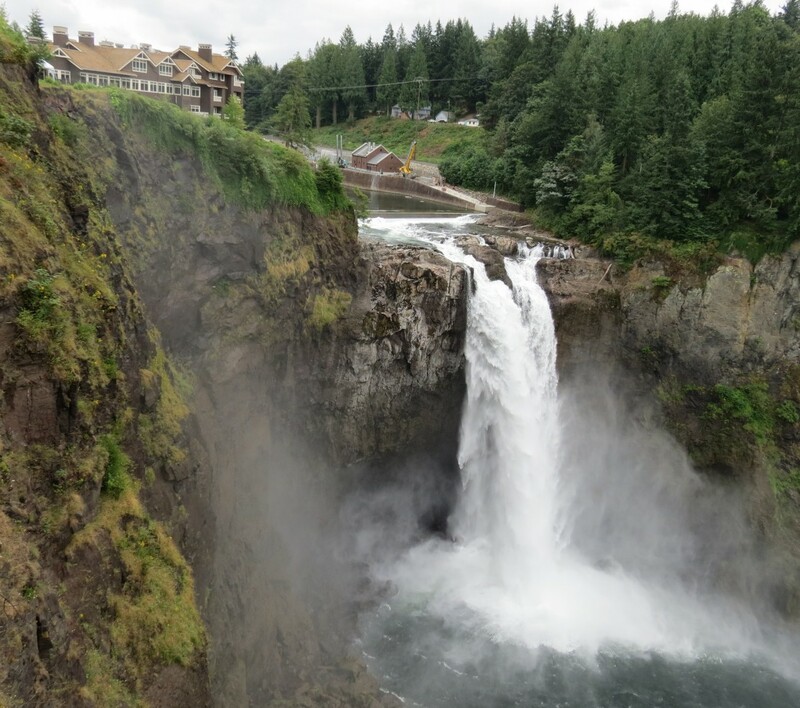 (In the writing sample for this post, I went back and touched up skips, unlike that of my Student review.) 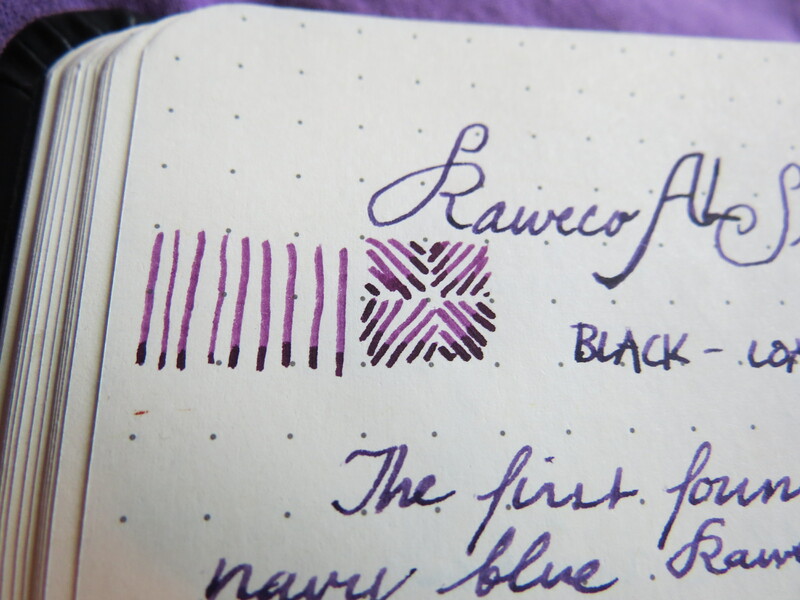 What I thought to excuse as an anomaly in my Student seems more like an inherent quality to Kaweco’s M nib. Now, I deliberately avoided the B and BB nibs because I’ve heard they cause problems, but I thought I’d dodge that bullet with the M. Apparently not. So it looks like I’ll be shopping out my AL Sport to a nibmeister before I can start singing its praises. It’s a real shame and a big disappointment because I’ve been looking forward to owning an AL Sport for a while. I’m just glad I didn’t pay full price for it. But you know what? 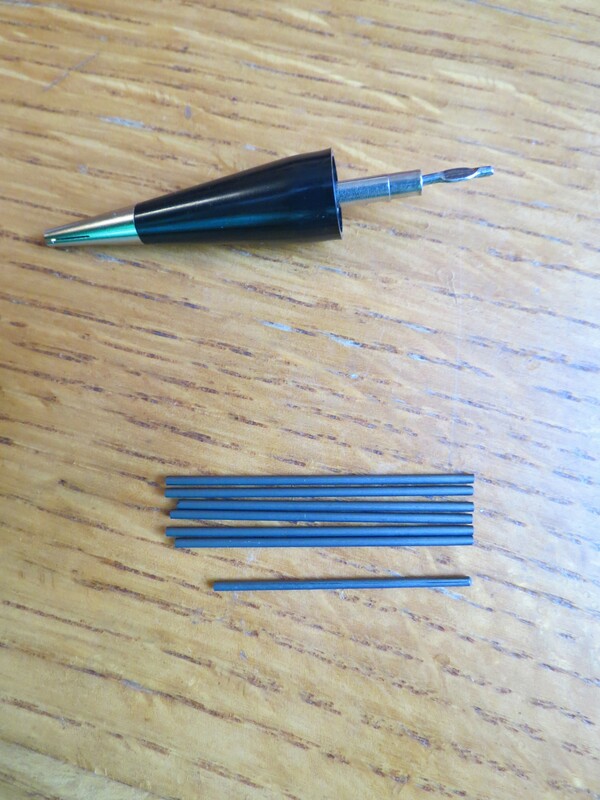 As much of a bummer this M nib is, it’s incredibly easy to swap out nibs on the Sports, so if I’m too lazy (and/or broke) to get it to a nibmeister, I can perform a pretty quick fix for $10.50 at JetPens. 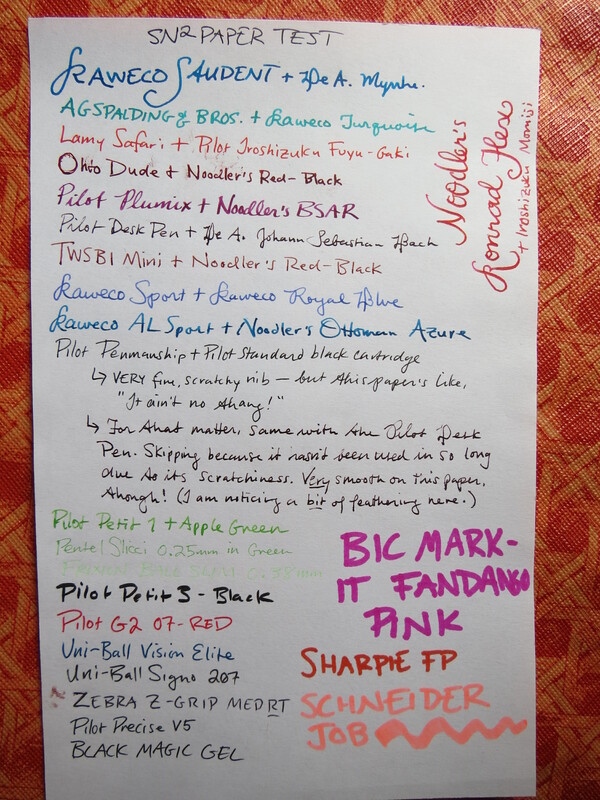 Last week, a reader brought my attention to the penultimate JetPens newsletter, which announced that soon they will be stocking other format options for Tomoe River Paper. Thanks, dear reader! I’m excited to pass on the news that JetPens is now stocking the Tomoe River “Kanso” Notebook and Report Pad. “Kanso” means “simplicity” in Japanese, and these embody the concept completely. The B5 Notebook is $15. It is thread-bound with an ultra-smooth cardstock cover which is the same color as the pages inside. 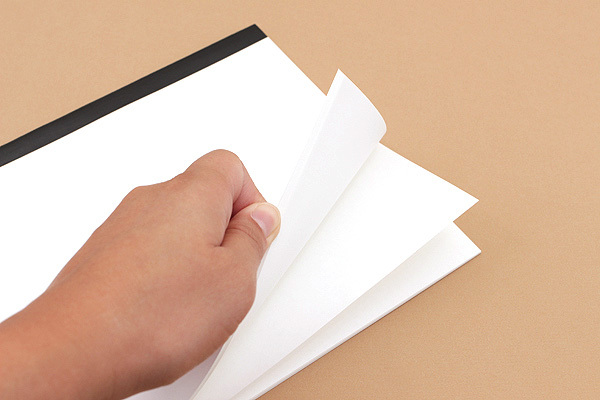 The A5 Report Pad is $4.75 with a glue-bound top, matching cardstock back, and an included lined guide sheet to place beneath the page you’re writing on. Both have 30 pages and are available in white or cream. Make your own DIY Tomoe River Paper Binder with this fun kit, which includes two packs of Tomoe River Paper, a Kokuyo binder, and a Carl hole punch. Just follow the easy instructions for the punch: line up the paper under the magnet strip, fold the edge side underneath the platform, and then line up the punch to the appropriate notches. You now have an easy way to create your own customizable Tomoe River Paper Binder! Credit for the images in this post go to JetPens. 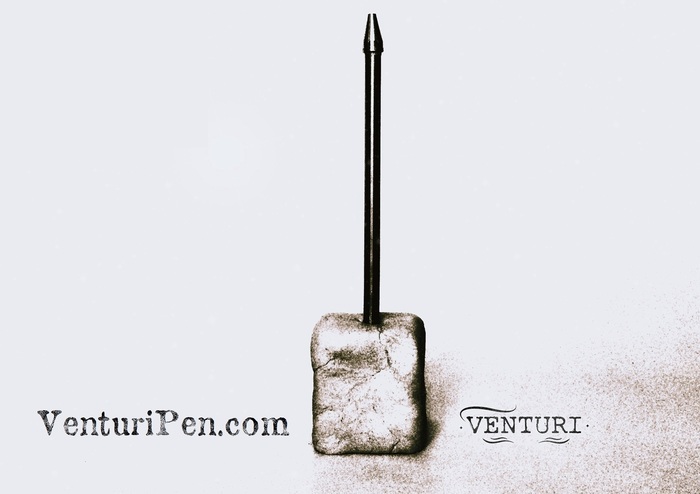 Yesterday, the Kickstarter for the Venturi One pen launched. 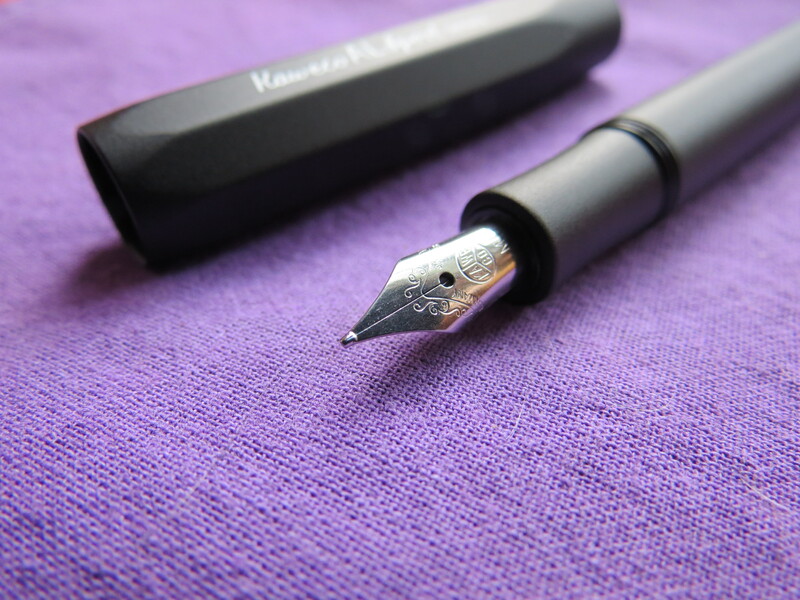 The Venturi pen is a minimalistic, hand-machined pen designed especially for the ever-popular Hi-Tec-C refill. This pen looks very promising, should the fundraising pan out well. The standard version is machined from solid 304 stainless steel, but they are making sterling silver and yellow gold versions available, too. The driving idea is a pen whose ultra-minimalistic design and materials will last a lifetime. I’m looking forward to getting my hands on one. I’ve only recently grown to really love the Hi-Tec-C and I’ve been keeping an eye out for compatible high-quality pens. I’m especially excited about the optional base they have created to house the pen: a cube of polished, cast concrete, in which the pen rests standing upright. Also, from the photos it looks like there’s a step up to the cone of the pen, which is unusual, and indicates to me that the barrel is very slim indeed. Do check out their Kickstarter page if you’re interested. They stress that this is a project and they need to work out a bug in the design, and after they receive the new prototype they’ll release a new video and photos. Keep your eyes peeled! At any rate, the lowest backing rate is only £20. And — even better — there is free international shipping! 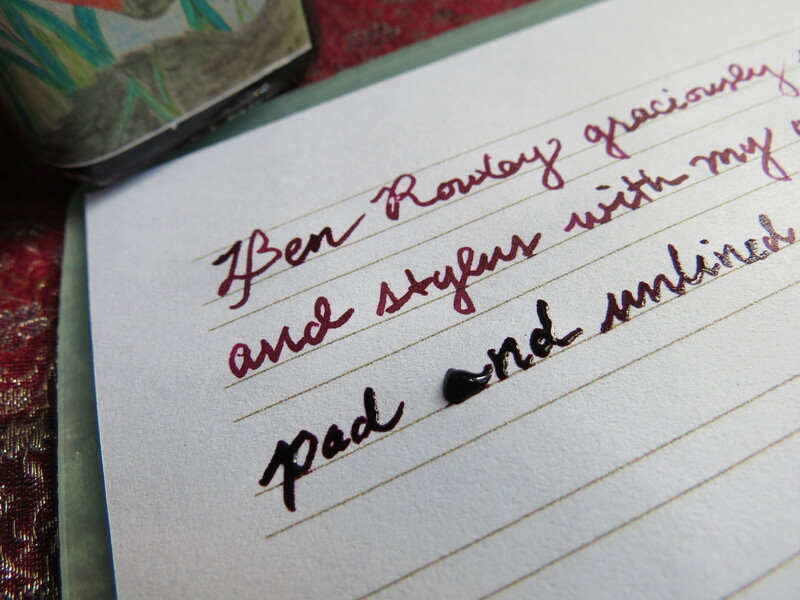 Azizah over at Gourmet Pens recently did a review of Ben Rowley’s paper, and it was thanks to her post that I managed to put in an order and take advantage of his stylus + nib giveaway! Thanks for the hot tip, Azizah. Y’all should check out her review; she goes into excellent detail about the construction of the pads, so I’ll skim over that here. 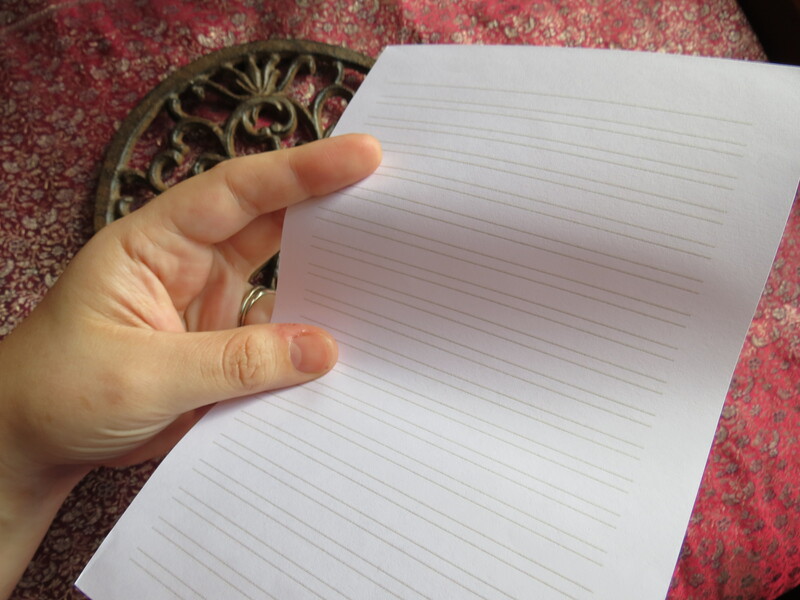 I’ve been writing a lot about paper recently, but almost exclusively about Tomoe River paper, so my interest was piqued when I saw Azizah’s review of this product. 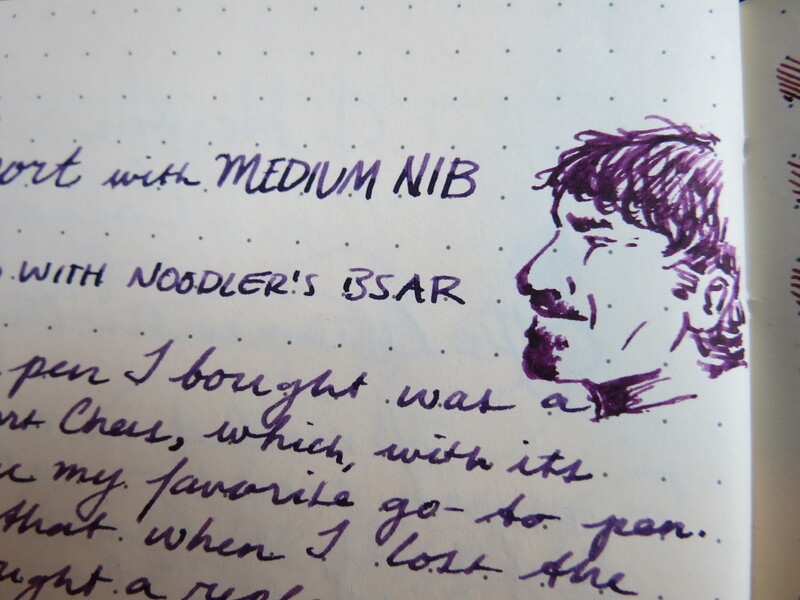 I have a handful of dip pen nibs that I use for playing with new inks, including some sketching nibs which I’ve found to be virtually unusable due to their scratchiness. 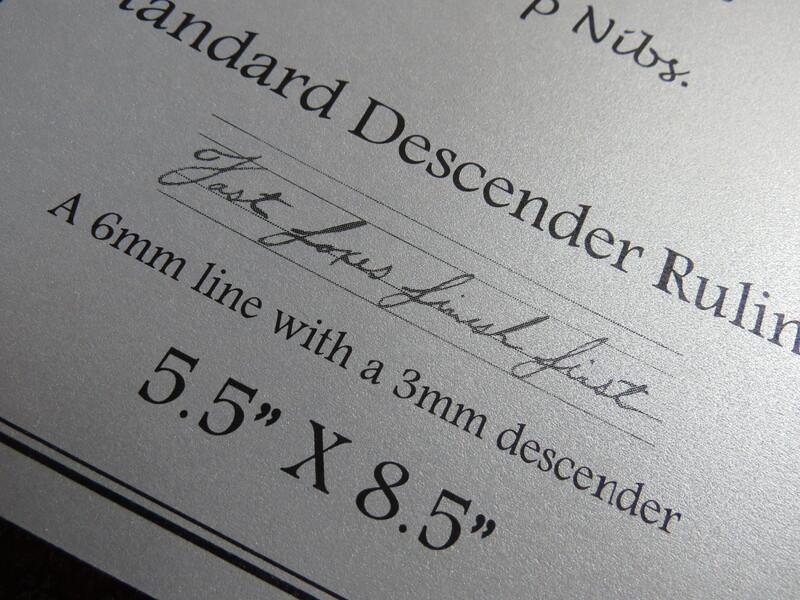 Ben Rowley’s paper is advertised as “the perfect paper for both smooth nibs and sharp nibs,” and his prices were so reasonable I had to pick up a couple of pads. The ordering process is so rudimentary it kind of feels like a back alley exchange, in the best way possible: I emailed Ben with my request, he emailed me a PayPal receipt, I paid, and in two or three days the box was at my door. And what did I get? 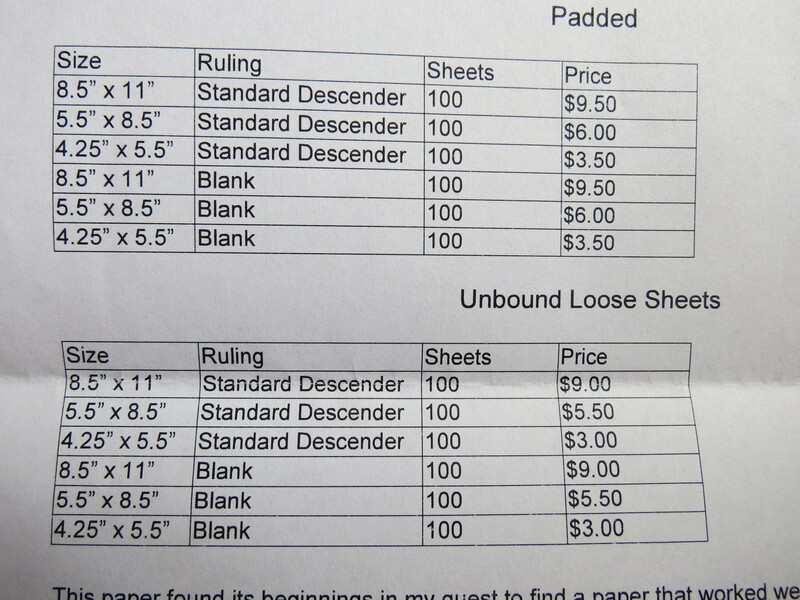 A bound pad of 100 sheets of “standard descender” ruled paper, 8.5″x5.5″, and 100 loose-leaf blank sheets, same size. And a hand-written thank-you note from Ben! That was a nice touch. 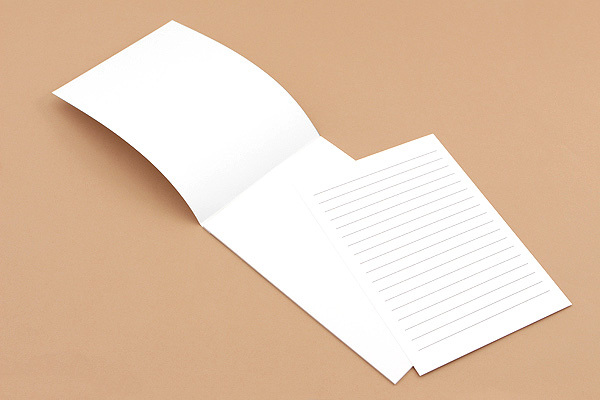 This paper is narrower than the Tomoe River correspondence sheets sold by Paper For Fountain Pens, just the right size for a standard A5 envelope, so you don’t have to fold in the sides at all. It’s definitely heavier than TR paper, but most paper is. 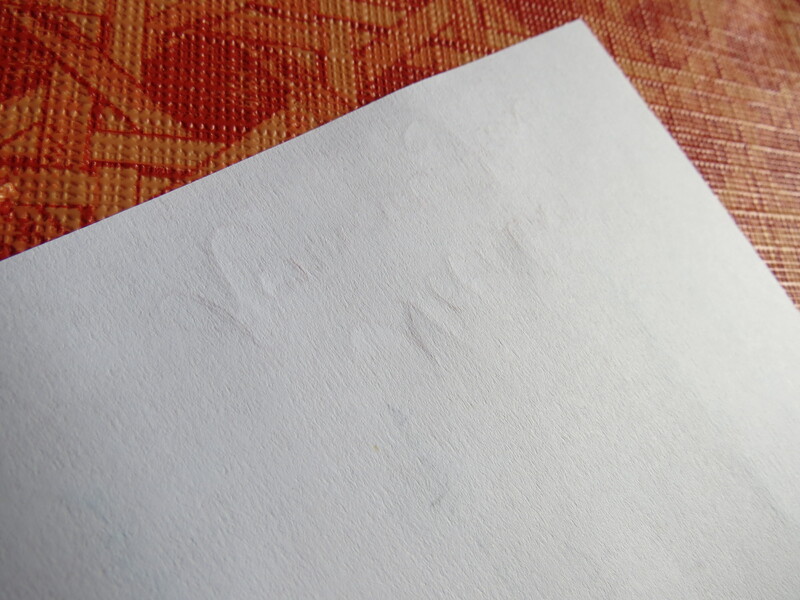 One side of the paper has a slightly rougher texture, whereas the other side is smooth. I’m not sure which is supposed to be the “front” of the sheet, but I prefer the smooth side for fountain pen usage; the rough side is nice for pencil work. 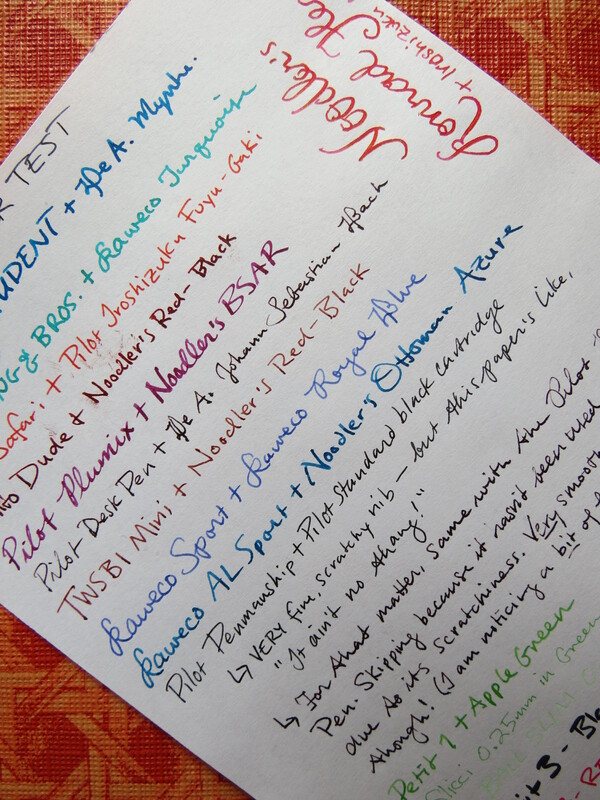 I tested all my currently inked fountain pens on an unlined sheet and was very pleased with the results. 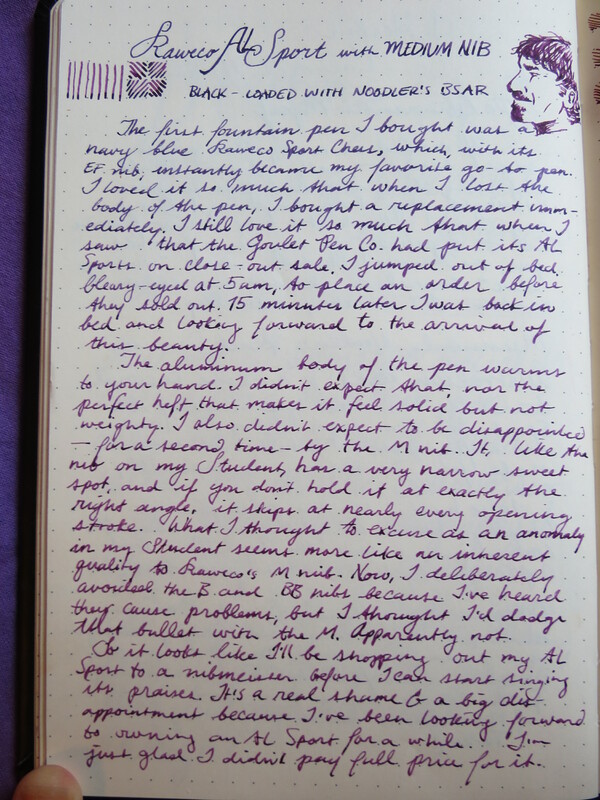 The only feathering I noticed was with the Pilot Desk Pen, but I think it might have been partly the fault of the ink, De Atramentis’ Johann Sebastian Bach, and the fact that the pen was running a bit dry due to not being used in a while. 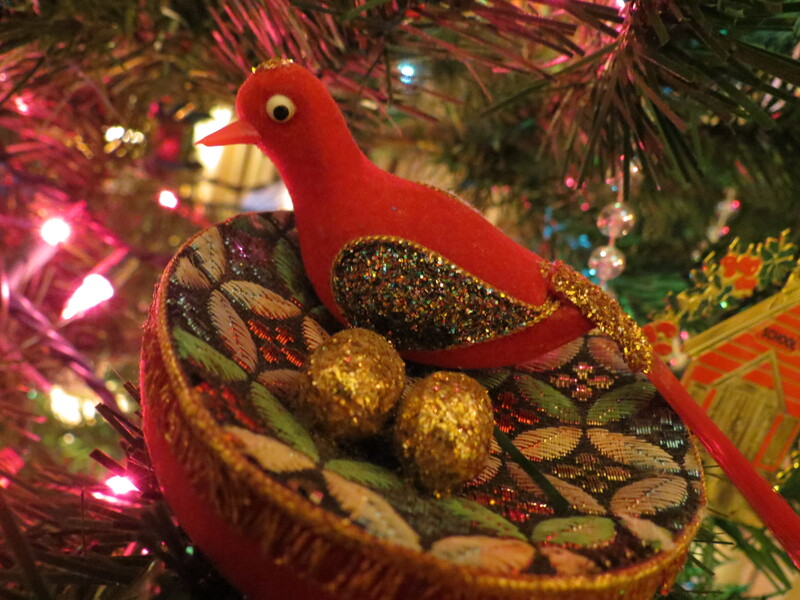 And I had to peer very close to see the feathering. Much less of an impression left than with the TR paper! Here’s the back of the sheet below. You’ll notice that the only bleeding was with the Sharpie and the Bic marker, and there’s very faint ghosting otherwise. 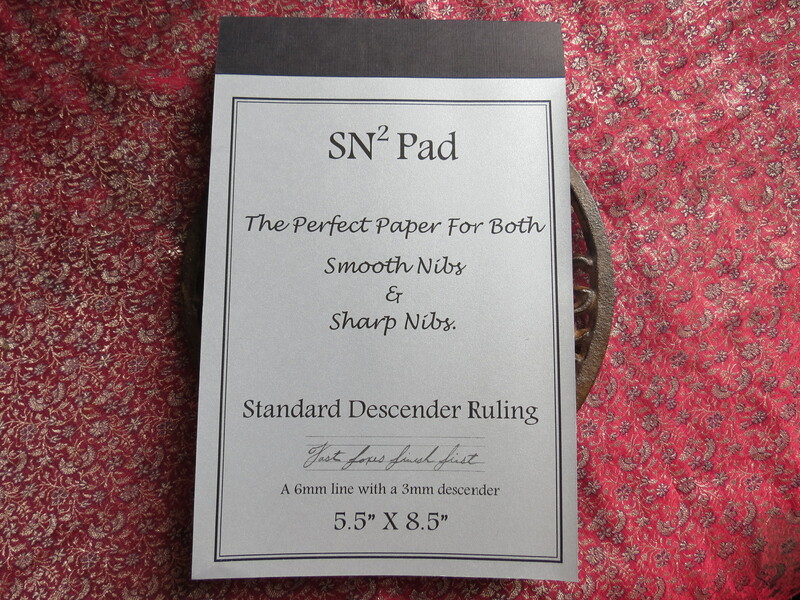 When I ordered this paper, I thought I’d be using the standard descender pad a lot for script practice, but so far I’ve gone through quite a bit of the blank sheets in my correspondence. It’s fantastic letter paper! I usually decorate the first page with a stamp of some kind — my letterhead, or some sort of illustration — and there’s no prettier stationery you can get at that price. Like I said above, it fits perfectly into an A5 envelope, and while Ben doesn’t sell envelopes, you could purchase a block of loose-leaf 8.5″x11″ paper and make your own, or go with some simple A5 kraft paper envelopes, which complement the paper beautifully.